Meet The Parent Council Volunteers Making positive Change Bringing a Playground to Hyland Heights, The Hyland Baseball Diamonds and the surrounding community! Click image below to visit photo gallery coverage. Dufferin Oaks Volunteer Appreciation Dinner for 2016 is an annual event and very well attended. Local dignitaries, MPP Sylvia Jones,Laura Ryan, Warden of Dufferin County and Mayor of Mono, Mayor of the Township of Melanchthon, Darren White and Shelburne's own Reverend,Pastor Gord Horsley and his wife, Kate were in attendance as well as approximately 120 volunteers. collectively contributing to 17,000 volunteer hours through out the year. The Theme for 2015 was"Volunteers Are The Roots Of a Strong Community," and these volunteers are certainly appreciated especially when considering the need for volunteering is continuously rising. Special Note: Angie Matthew, Program Coordinator for Long Term Care utilized the Memory Music Program, wherezheimer's patients are provided with IPODS that contain specially loaded music that is personal to them, music that brings them to a happy memory and the program seems to have left it's mark in a positive way for patients. In that respect, it will be interesting to see even more progress for 2017. Shelburne's Dufferin Oaks Long Term Care Facility is well known for it's high standards and excellent care of our dearest part of our society, our beloved senior. Thanks again for a wonderful year and The The Shelburne Freelancer will see you again next year. Fundraising For New Playground Off To Wonderful Start! WOW! (above) Parent Council Volunteers Rebecca Hall and Charity Pigeau hit it out of the park raising almost $7000 with their Hyland Hawks 3-Pitch Fundraising Tournament. Parent Council Volunteers, (LtoR) Rebecca Hall and Charity Pigeau of Hyland Heights Elementary School jumped into action when their school playground was deemed unfit and was sectioned off. This June 2016 saw their first Fundraiser raising money to replace the old playground with a new, friendly, green community playground that will be accessible to the school, the adjacent Hyland Park Baseball Diamonds, and the surrounding neighbourhoods. The Hyland Hawks 3-Pitch Fundraising Tournament exceeded expectations raising close to $7000! Hall and Pigeau extend thanks and gratitude to all who attended and helped to make the tournament possible. “Today’s announcement signals the Minister has listened to the concerns raised by thousands of parents, experts, organizations, municipalities and both opposition parties regarding the government’s original decision to remove children over the age of five from receiving Intensive Behavioural Intervention (IBI) therapy. Since the March 29th announcement, the Ontario PC Caucus and I have been working directly with families impacted by the government’s decision and service providers on how to address this issue. We continuously called on the government to reverse their decision and shared countless stories from families and experts that spoke of the benefits of IBI therapy for children over the age of five. With today’s announcement, no longer will children over the age of five be removed from receiving this life-changing therapy. I want to thank the Minister for making these important changes. We look forward to reviewing details of the government’s plan, and we will continue to advocate on behalf of affected families as the government moves forward with implementation. Every child deserves access to life-changing therapy, and I look forward to continue working on ensuring every child in Ontario reaches their fullest potential,” commented MPP, Sylvia Jones. Exceptional Grade Three Students of Hyland Heights Elementary School Raise Money Donating $120.50 to Headwaters Health Care Foundation! Nicole Hand, Annual Giving Manager the Headwaters Health Care Foundation (R) addresses the the children thanking them for their hard work holding a hard hat signifying the the ground breaking which has begun expanding the oncology section and confirming how important their contribution is. IT ALL STARTED WITH AN IDEA FROM A KID NAMED DYSON..
Dyson Fegan (R) is a caring grade three student at Hyland Heights Elementary School. Observing the world around him, he noticed a lot people need help with different things in life,commenting,"I thought we should start raising money too." Fegan decided the money he would raise would go towards the fight against Cancer. When Dyson's friend, Courtney (L)heard about what was happening she decided to help, creating her own invention, the Mollypop. Now For those of us who are not quite grade three savvy to keep up with current trends, a Mollypop is a cut out mounted onto a Popsicle Stick. Kids could spend any amount to purchase a Molly Pop they could draw a face on and that would entitle them to a ticket for a viewing of a student written play and a chance at winning a $25 movie gift card, donated to the kids by their extremely supportive teacher, Marianne Millsap. All the students seen in the group shot helped or supported the cause in one way or another and with a little help from their friends, $120.50 was raised and donated to Headwaters Health Care Foundation's Annual Giving Manager, Nicole Hand during a check presentation. School Principal, Wendy Clarke, Teacher Marianne Millsap, and E.A Lori Ursu were instrumental in helping kids achieve their goal. Hand points out that while most of her work as Annual Giving Manager is conducted among adults, she revels at the opportunity wot work with children commenting, "It's not about the amount, it's about what they did and why! We need more of that! " Hand reaffirmed to the children that it's every dollar that counts and their money raised is greatly appreciated and to remember the "Good Feeling" they get when they help people and to keep doing these wonderful things even when they are adults. A proud day for all of Shelburne! WAY TO GO KIDS! Click on image (L) for Video of these fine youngsters explaining what they did and why they did it. Find out who they wouldn't help and what their plans are for next year! IT'S THE GOOD STUFF! THE REALLY GOOD STUFF! Special Thanks To Fellow Journalist and Reporter, Marni Walsh for her idea having the kids shout, " We did it!" during photo taking. Great idea! Note From The Shelburne Freelancer Alex Sher, " These kids are so amazing, the new world of thinking of help first ask later, whoever you are, wherever you are from and now they know they too have power to actually do good ! So powerful speaking with them, it was a tear jerker and a reality check of reflection, Have I done enough Good Today? Thanks to these fine young people. What an honour to know they are what's coming next!" To Enjoy Canada Day Festivities On Our Events And Classified Page. The Shelburne Street Festival Success. Click here to see full coverage. With A Thank You For Sick Kids & A Penny for Your Thoughts! 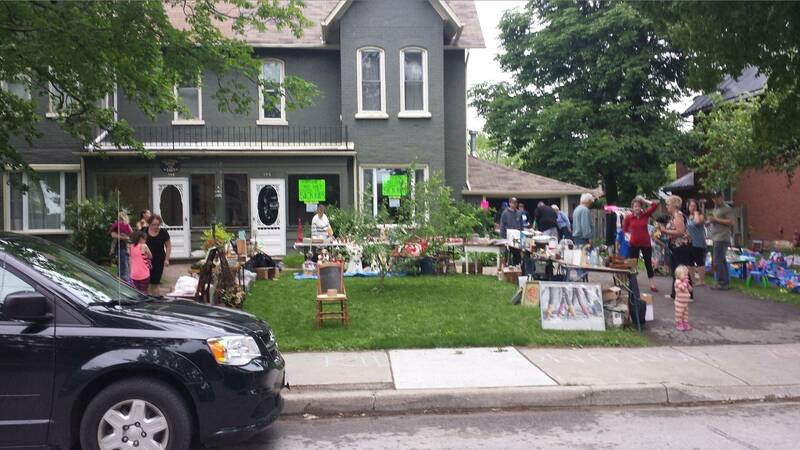 Grateful parents,family and friends attended the 2nd Annual Garage Sale Event in support of Sick Kids Hospital on Saturday, May 11, 2016 held on First Avenue West. Sick Kids Hospital has been refuge and saving grace to so many families in need and the gratitude experienced for the services they provide is difficult to explain. 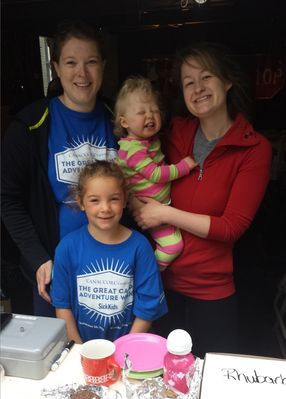 (LtoR) Cassandra Bryan, and her daughter, 6 year old Ann Bryan wear matching T-shirts in support of their friends, two year old, Penny Clarkson and her mother, Amanda Clarkson during their 2nd Annual Garage Sale Fundraising Event For Sick Kids Hospital. 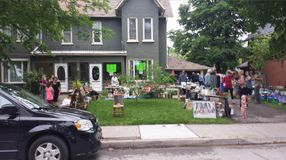 To produce a sale of this magnitude requires a lot of effort and support from family and friends, and even neighbours dropped of items for this charity. 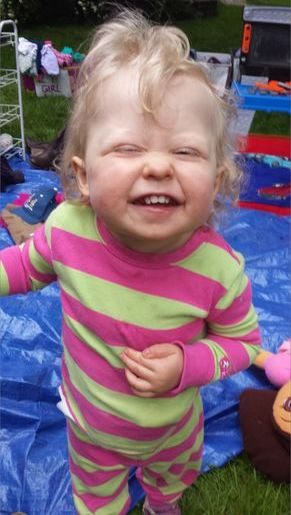 Just one look into 2 year old Penny's face sporting her best 'picture ready smile face' and it would be difficult to imagine a world without her in it. That's the kind of gratitude that drives, Penny's parents, Matt and Amanda Clarkson to raise money for Sick Kids Hospital.
" Penny was born with congenital heart defects including the fact her heart is on her right side, not the left, " Amanda Clarkson explained,"She was diagnosed at six weeks. At 14 weeks, she had her first open heart surgery, and spent a month and a half in ICU." Obviously an unfathomable experience when faced with uncertain future possibilities, the Clarkson's know all about lack of sleep and tremendous worry. Fortunately the Clarkson's also know about strength of spirit and resilience as their hopeful and positive attitude seems to greet people and situations with a kind and authentic, genuine manner. Without a pause, Clarkson revealed her daughter spent 198 days in Sick Kids and now she is home, thriving and life is wonderful. Perhaps a little much needed rest and recovery will ensue. parents bring their child home,.." Clarkson sadly paused, adding, " We are so fortunate and grateful." "We raised $1550 at the yard and bake sale from the community's generous support. Thanks so much again for being so interested in the cause and spreading the word, we really appreciate it. In total this year so far we've raised $2500!," commented Matt Clarkson. And that "Thank you" is something people hear a lot from the Clarkson's. Scotia Bank will be generously matching the sum raised by the Clarkson's, a sum that can make all the difference to so many others who need Sick Kids Hospital. As for the cutest little Penny around, with Sick Kids Hospital in her corner, her future is very bright indeed. This story is definitely, "A Penny For Your Thoughts!" Thanks Sick Kids! Shelburne & District Fire Department visited Primrose Elementary School Tuesday, June 14, 2016 for an information and educational exchange coupled with fun and safety lessons.
" We try to fulfill every opportunity we can to promote fire safety, and safety in general, to the residents we serve, whether it's visiting schools, speaking to seniors groups, or attending community events and festivals. Our goal is to provide the information people need to know to stay safe," commented Shelburne & District Fire Chief, Brad Lemaich, adding, " The kids were very excited. We saw both kindergarten classes at Primrose. About 43 students in total. Each child received a sparky colouring book and pack of crayons after our visit." The Shelburne And District fire Department will also be attending this year's Shelburne Street Festival. In the event you missed out on the fantastic variety of fresh produce available at the Shelburne BIA Farmer's Market each Thursday from 3 p.m. -7 p.m. on corner of Owen Sound St. and First Avenue, Besley Country Market can help you out! Besley Farms also attends the Shelburne Farmer's Market each week, but this food stand is located on Victoria Street. Send in your photos of wildlife to The Shelburne Freelancer at alex@shelburnefreelancer.com and Share Shelburne With The World! No "Funny Photos" of relatives please! Take Your Photos & Send Them In! Shelburne is full of hidden treasures waiting to be found. City dwellers sometimes express the Shelburne experience as surreal, fairy tale like, and that's just a description of the environment. On any given day, one might have the pleasure of witnessing the charm of a Mennonite horse and buggy on a main street, a field of sheep almost ready to be sheered, the prance of horses over the rolling fields of a farm, cows grazing, a fox crossing a road, a wild bunny running across a back yard, beautiful gardens, but for many, Shelburne has gone to the birds! Oh the beautiful sights to be seen and the variety of these beautiful flight bound creatures is actually astonishing. Click on the Photo(L) to visit a beautiful In The Hills Article, chronicling Birds to be found in Dufferin County. Thank you, In the Hills Magazine! When It Doesn't Look Like A Grape? The Shelburne Police Services Annual Torch Run In Support Of Special Olympics met with great success Wednesday, June 1st, 2016 bringing in an amazing $13,000!! The 4.5k run, walk, ride, began at Shelburne's Fiddle Park and finished up at John's NoFrills for a Congratulatory BBQ and special thanks to sponsors and Contributors of this wonderful event. Missed it? Click on the image (R) for video coverage. Featured (LtoR) Shelburnite, Gord Craig is presented with prize won during the Shelburne Police Services Annual Torch Run Fundraiser in Support of Special Olympics by Constable Paul Newmann, Event Organizer. Craig won a gift basket from Georgian Career & Employment Community Services. Craig also raised $339.00 on his own in one day making him the second highest individual fundraiser. According to Craig, it was the Shelburne Business Community who contributed 85% and regular Shelburnites generously stepped up for the remainder of the funds he raised. 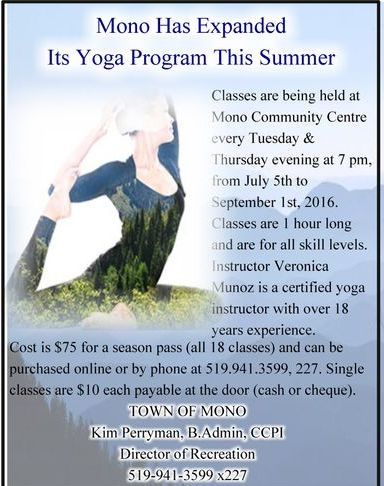 Click on image (L) and visit the Shelburne Police Services Website for more information on the Fundraiser. John's No Frill's Banana Mascot getting a huge hug From Shelburne & District Volunteer Fire Fighter, Randy Narine.